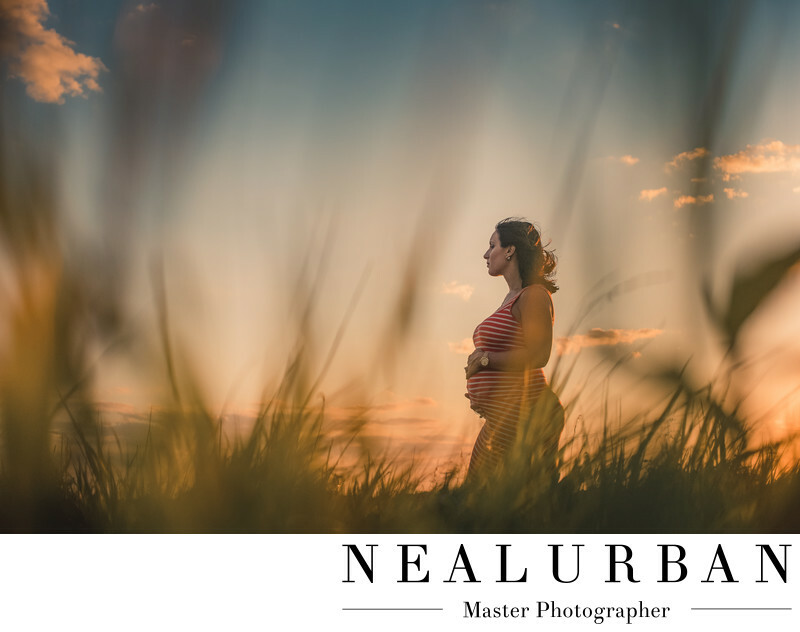 Tift Nature Preserve is one of our favorite locations for maternity portraits. The landscape is beautiful. We seem to get some amazing colors and skies as well! Natalie and Joe had just that. We had already done their wedding photos and captured amazing memories. That was held at Pearl at the Webb in downtown Buffalo. Their wedding photos were done at Herschell Carousell Museum in North Tonawanda. Now it was time for maternity and arrival of their son. We love taking pictures through tall grass. It adds such a great texture and effect to images. We always get some great effects like this at Tift. The key is to shoot the image from a very low angle. Just like you see here. Neal was laying in the grass. Then we positioned Natalie in between the blades of grass. We wanted some to cover her, but not too much. This portrait session was right around sunset too. The sky was lighting up orange and red. We loved how some of the sky was still blue too. There were not many clouds, but just enough to create those colors. We had Natalie put her hands on the belly and look off. We wanted more of a profile for this image. There was a slight breeze. Just enough to blow her hair in the wind. It looked so good, we did solo portraits of her, then brought in her husband and daddy to be for more! They came back to Neal Urban Studio to see us for a hockey themed newborn session. Then a year later for a camping style first birthday cake smash! We love capturing timeless images for this family! Location: 1200 Fuhrmann Blvd. Buffalo, NY 14203 United States.